If you want to use lighting in your house, white LEDs are basically the only way to go. RGB lights look cool, but for normal lighting at the place where you eat, read or cook, any other color then white isn’t going to work. Colored light can be used for accent lighting and a lot of other things but it’s most often used in conjunction with white, so, let’s talk white! 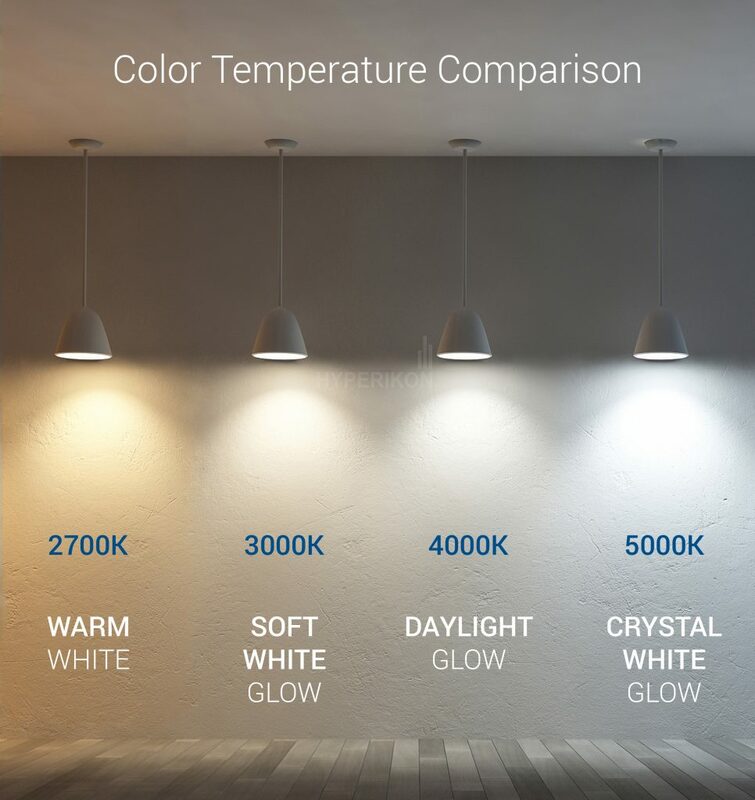 This scale is a bit exaggerated but it does clearly illustrates that white can mean a lot of different things which makes it really hard to buy the correct light. What most people are used to is between 2700k (bulbs) and 3100k (Halogen) lights, that’s what most people have had in their home for the past few decades. In offices they tend to use a bit higher kelvin lights often around 4500K, it is said that higher kelvin lights work more energizing and thus are good for productivity! Here is another good comparison in pictures, courtesy of hyperikon. Ok, so now we can pick the color of light we want. For a cosy setting something around 2600K~2700K or even close to 3000K is good and for work environments, garages and other places a bit higher value around 4000K is often better. But next to the light being white, there is another value you should pay very close attention too, especially when it’s not listed! Next to the light emitting a pleasing color there is something which is actually more important when selecting a white LED strip or light, white light is not all created equally anymore. As you can see, Sunlight vs LED vs Incandescent vs CFL all present very different patterns. LEDs can be produced in a variety of different colors but they don’t all have the same characteristics. I don’t want to really go into that but what is interesting to know is that it’s easiest (and thus cheapest) to produce a very bright blue LED. 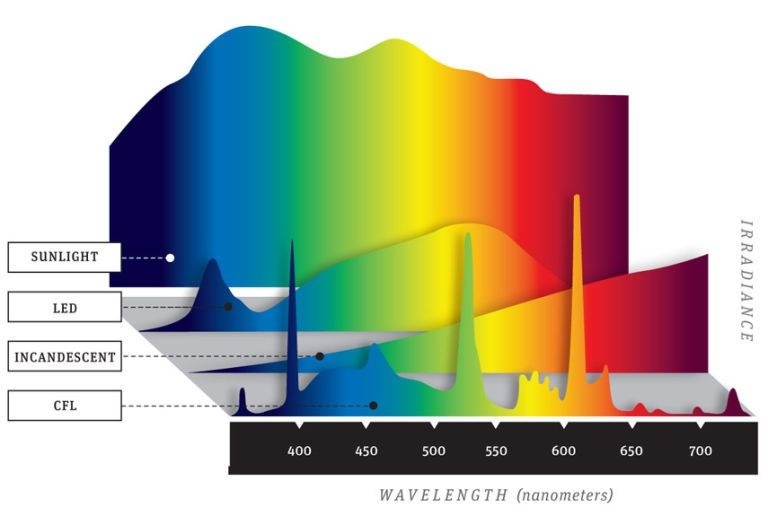 So most white LEDs are created using a Blue LED with phosphor color filters laid over it. But, this is also where things go wrong. 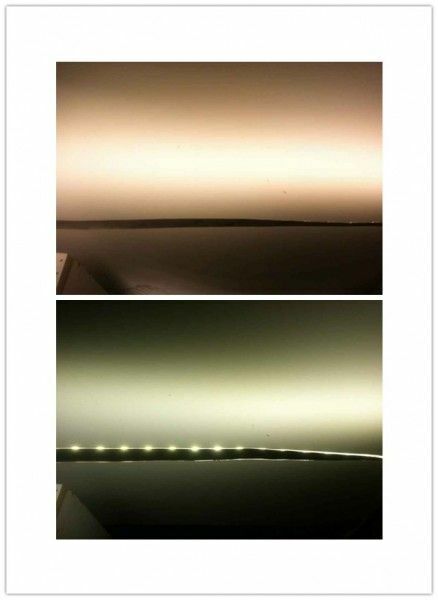 The cheap cheap (warm) white LED strips you see for sale everywhere, they are made this way. A phosphor layer is coated onto the blue LED to try and have the light that comes off it to be yellow, since many people link that to being “warm white”. The problem is, true warm white is made up out of a whole different spectrum then just some colors blended together to look yellow at the source. First glance people look at the LEDs and the light looks yellow and thus assume “warm white”. The problem with that is that everything the light hits and then reflects back is slightly (or way) off in color! 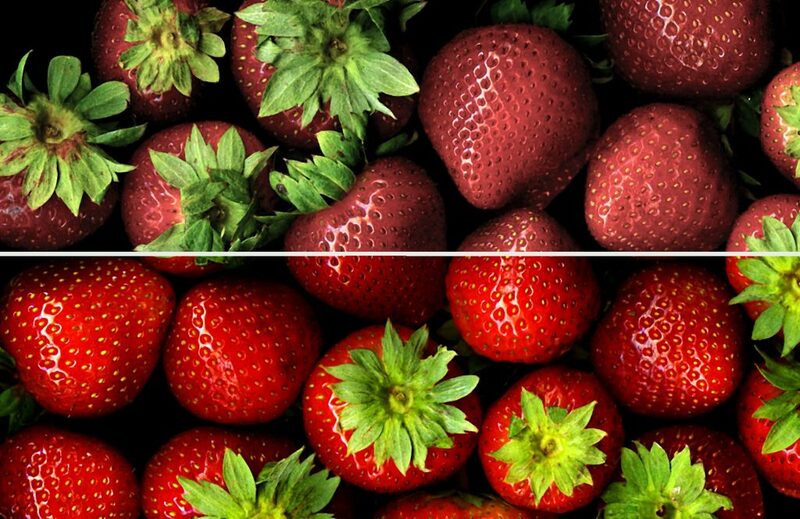 Since most often there is way too much Blue and Green but too little Red, this makes everything look very wrong, often sickening because of the green hue. For instance, if you try to use one of these lights in your kitchen and try to cook a steak, you’ll be baking for hours because you will never get the idea that it’s done because the light illuminating the steak doesn’t have the correct color red inside of it! 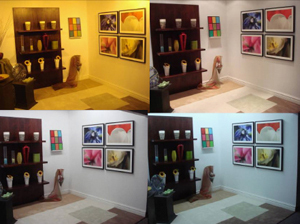 Look at the following picture, each time the room is lit with a “white light”. Judge the pictures for yourself, which one would you chose? The picture in the top right corner is one using High CRI quality LEDs, that means that all colors come out correctly and balanced. In the other pictures there is always a color out of balance and thus distorting the picture and your vision. The bottom half is meant to reflect High CRI/Ra LED light and the top one a low value. For me personally when looking “through” bad quality LED I often get the feeling I’m looking through some weird fog. It’s not that the image is unclear but it still hard to focus for some reason. High CRI light often has the opposite effect that everything looks very vibrant and sharp. This is a very basic explanation but this is why there are a lot of cheap LED (strip) lights sold for onle a few $ and people still believe that LED light cannot replace old Incandescent or Halogen bulbs. There are however much higher quality LEDs! In the Film and Movie industry LED lights were banned and deemed unusable for the longest time for the reasons I explained above. When you film something you capture the light that is hitting an object or a person and is reflected back into the lens. But since red colors where often completely skewed, people’s skin would look horrible for instance, totally unusable! But since the invention of the LED a lot has changed. 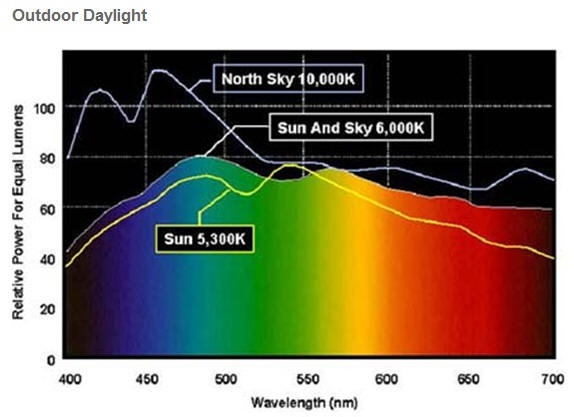 Science has progressed and they are now pretty good at making color accurate or as they would call it, High CRI LEDs. These are (a lot) more expensive than the cheap stuff, but also give a MUCH more pleasant light. For instance, all my videos are filmed under LED light and the colors (and skin tone) look pretty good! This result came after testing about 15 different suppliers and type of strips before settling on the one I wanted to use. My girlfriend also played a big part in this because, as it turns out, we are both very susceptible to colors being off. Since we where going to build our new house and wanted to use LED lighting everywhere, this became a big concern and thus my research into this topic. Check out this article about my favorite white LED strips, I’ve tested a lot of them! Also make sure to also check out my article about 12v vs 24v LED strip!